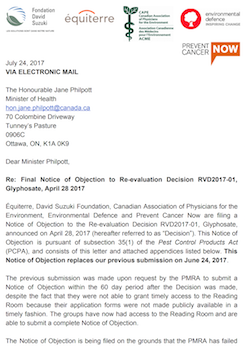 Recently, Équiterre, the David Suzuki Foundation, the Canadian Association of Physicians for the Environment, Environmental Defence and Prevent Cancer Now published an open letter to contest Health Canada’s flawed evaluation, which led in granting continued registration of products containing the pesticide glyphosate for sale and use in Canada. It may be recalled that glyphosate is the most used pesticed in the world and was categorized as a probable human carcinogen by the World Health Organization (WHO) agency specialized in cancer research. A month earlier, the aforementioned groups filed a notice of objection to the previous Canadian Health Minister Jane Philpott, calling on her to reconsider Health Canada’s decision to grant continued registration of products containing the pesticide glyphosate for sale and use in Canada. The groups are calling for the Minister to set up an independent committee to assess the real risks of glyphosate under the Pest Control Products Act. Otherwise, the next re-evaluation will be conducted in 15 years, so the time for action is now! The groups believe that Health Canada Pest Management Regulatory Agency (PMRA) failed to consider and even dismissed important scientific data in its decision with regards to the impact of glyphosate on public health, milkweed and monarch butterflies and microbiomes - essential microorganisms for humans and soils. Consult the notice of objection. Beyond the weaknesses of the review process, the proposed risk management strategies, including buffer zones and labeling, does not take into account the many studies that demonstrate their serious limitations. For all these reasons, the glyphosate evaluation process is therefore flawed and should be redone. 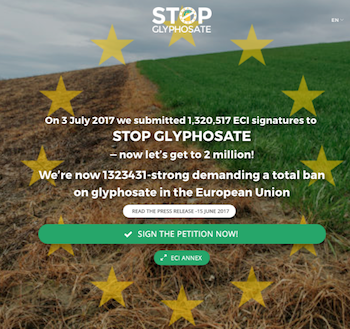 More than one million European Union (EU) citizens across all 28 EU member states have signed a petition calling on the European Commission to present a legislative proposal to ban glyphosate, reform the pesticide approval process and set mandatory targets to reduce pesticide use in the EU. This collaborative effort involving over 100 organizations is the most successful campaign since the EU introduced the European Citizens’ Initiative (ECI) in 2012. Letter and attached documents sent to the Health Minister from Équiterre and its partners. 58 pages of data! Learn more about the pesticide evaluation process in Canada and the influence of the powerful chemical industry in Bruce Livesey’s two-part investigation, Bureau of Poison, in the National Observer. The report describes Équiterre’s tireless efforts to obtain access to public information that has been suspiciously withheld. Two-part investigation “Bureau of Poison“.